Home / Fortuna Energy Inc. It was in 2005 that Fortuna Energy Inc., a subsidiary of Talisman Energy and the most successful Natural Gas Exploration and Production Company in the New York State, found themselves seeking out the services of Noise Solutions. 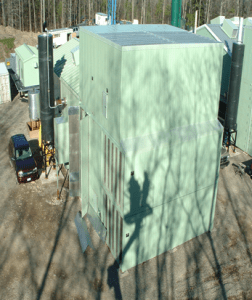 Fortuna was planning to expand their existing natural gas compression facility in Catlin Hill, New York to include the installation and operation of three CAT 3516 TA LE Compressor Engines (K 100, K 200, K 400) with corresponding Air-X-Changers 144 EH Coolers approximately 32 meters from the existing compressor building. It was evident that robust noise suppression equipment was essential on the Catlin Hill site that has a strict, allowable noise target of 58.5 dBA. This, however, posed a unique space issue, as it was severely limited for the noise suppression equipment that would be required. The skilled Noise Solutions team got to work to design a solution that would be cost-effective, size-appropriate and efficient to achieve and maintain the strict noise regulations that were required. The equipment, manufactured at the Noise Solutions plant in Alberta, Canada, was shipped close to 3,700 km to Catlin Hill, New York. This created a fair amount of structural design and shipping challenges that needed to be addressed. In order to meet the regulated requirement of 58.5 dBA at 32 meters, Noise Solutions custom-designed the highest quality equipment to achieve and maintain the challenging end result. This included Induced Draft Acoustical Building Inlet Ventilation and Fan-Forced Acoustical Building Outlet Ventilation to ensure superior noise attenuation, along with Zeron® Engine Exhaust Silencers and Engine Air Intake Silencers to trap and extinguish exit and entry noise. Cooler Fan Silencers and Plenum Walls were also custom designed to meet the site’s attenuation, shipping and structural needs. An Acoustical Compressor Building, complete with Skid Lagging, was also supplied for the K- 400 unit. The combination of noise suppression equipment installed, ensured that all noise sources and frequencies were successfully attenuated. The superior quality of Noise Solutions’ suppression products and services successfully exceeded the required noise regulation of 58.5 dBA. In fact, the installation of just one Noise Solutions Cooler Fan Silencer brought the noise output down from its initial 68.1 dBA to 54.2 dBA, making this another successful project by Noise Solutions.